1. In a small pot, combine balsamic vinegar, honey, thyme, and garlic. Bring to a boil and reduce heat to low. Simmer 10 minutes until the sauce thickens. Remove garlic and thyme sprigs. 2. Coat Haskell’s Sea Scallops in olive oil and season with salt and pepper. 4. Sear the Sea Scallops for 2 minutes on each side. 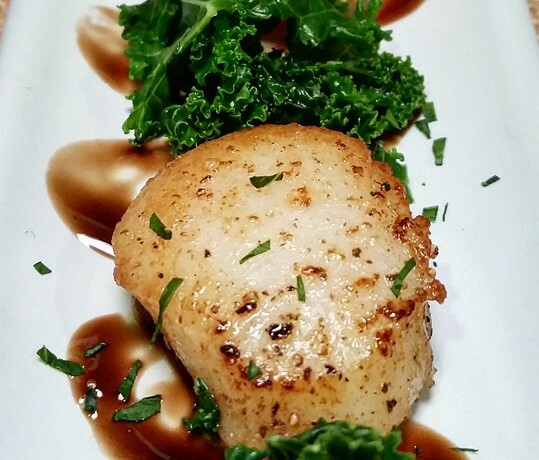 Transfer the Sea Scallops to a serving platter and drizzle the balsamic thyme reduction over top. Serve with accompaniments such as mashed potatoes, steamed kale, or salad.